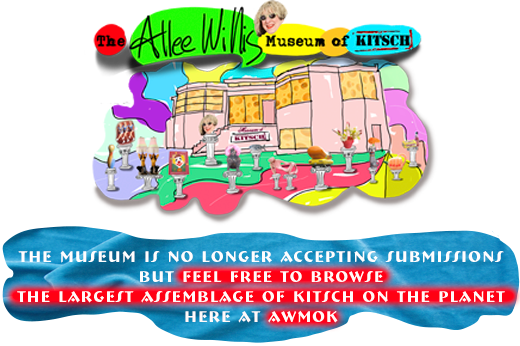 The Allee Willis Museum of Kitsch » HELP! I need a breathing treatment after finding this pic! Little old ladies and martians make for one kitschy picture! HELP! I need a breathing treatment after finding this pic! 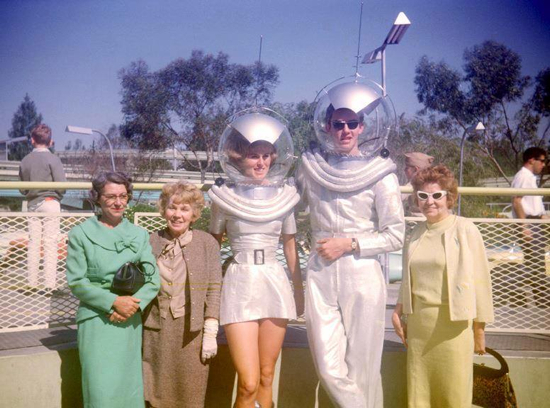 Little old ladies and martians make for one kitschy picture! I’d kill to know where this was taken! Check out the hair in the lady martians bubble helmut! Definitely a lot going on in this picture! Oh I wish I was on THAT trip!! I still need a breathing treatment when I look at this pic! I think this is Tomorrowland @ Disney Land. Yes, in that case a helmet would certainly help. I can absolutely confirm this is the old Tomorrowland at Disneyland. The ride behind them is the old flying saucer ride, and I remember it well from when I was a kid. Unfortunately, the ride broke down a lot, and you had to be a certain weight to ride it alone, which I wasn’t so I ended up having to ride it with my dad, which was not nearly as fun as it would have been otherwise. The “saucers” were inert themselves, the platform they were on had little disc valves that when a saucer was over them, air would flow through and elevate the saucer on a cushion of air. Also, getting in and out was hazardous, as people had been known to get their foot stuck in the air-discs, even though the air is shut off while boarding. Eventually, all of Tomorrowland was deemed out-of-date, and they did a major rebuild, the saucers were gone at that point. I think the saucers were located about where the “Carousel of Progress,” (later Innovations) building was built. Thanks so much for that info!